A few additional words here: I’m actually kind of amazed this is considered an FCC type-accepted radio, but it is, apparently under Part 90, not Part 95. It appears to transmit outside the ham bands, though I haven’t tried it. But for an incredibly inexpensive radio, about a third the price of the most inexpensive Japanese competitor, it’s quite a bargain. As noted, it can be frustrating to program, so you’ll probably want to get the programming cable and download the software from the manufacturer’s website. 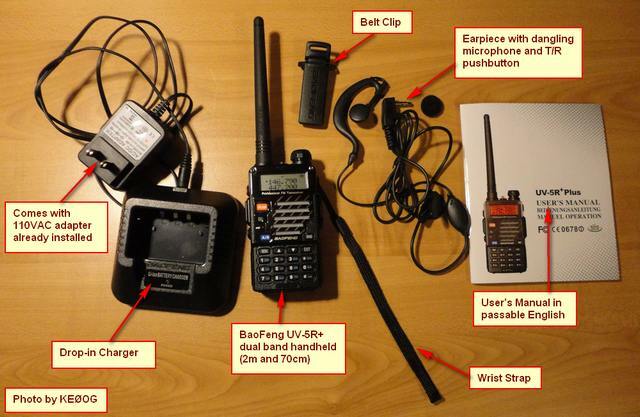 This entry was posted in Ham Radio blog entries, Product Reviews and tagged BaoFeng, UV-5R+, UV5R. Bookmark the permalink. Our local club advised me the Baofeng UV-5R+ has a “dirty RF signal” according to a November 2015 QST review and not to use. I cannot find the review for my Baofeng Radios, one member recommended RT Systems Cable and software for programming. CHIRP software via computer-cable would not me to enter club repeaters “radio will not support this software” or similar error message. Am watching U-tube videos for more information to setup radios as scanners if need be. Thanks for the great video series. I am writing to thank you for the video introduction series on the Technician class license I found on Youtube. I am writing this on the UV-5R+ review because the only reason I’m studying for the test is because an acquaintance was so insistent on the need to get that transceiver. I got a deal on Amazon… 2 of them for about $60. I am pretty impressed. I ended up buying the longer antenna to hit our repeater up on Chestnut Ridge and to hit the WVU Club repeater in town. I can now trip them both. I figured out how to download CHIRP free software and in about an hour had both of them programmed with all sorts of repeaters in the region for when I travel. I loaded the NOAA Weather freqs, too. For the money it’s a nice radio… but get the bigger antenna. I just bought this awesome little radio. The price has come down even more. I paid $34, free shipping and it came WITH the USB cable that most places charge extra for. Thanks for the review. The only stand alone 6 meter radio I can think of is one by Ranger. It is AM/FM/SSB and I think it has CW capability. I believe there is also an optional CTCSS tone board available. The last time I looked at the web site they were asking $319. I’m on the lookout for an inexpensive 6 meter unit. Have you done any research on a good unit to do the job without a lot of money. I have a Kenwood v71a and TH-F6 which really enjoy but I’d like to get into the 6 meter band. I’m working on my General ticket. By the way, your video for the Tech were a huge help to me, I aced the test. I’m now starting the General walk. I have watched the first 3 video’s so far.